Leviton 2-Pole 3-Wire Polarized straight blade connector accommodates wire of size 18 - 12-AWG. It has cord range of 0.245 - 0.7-Inch. 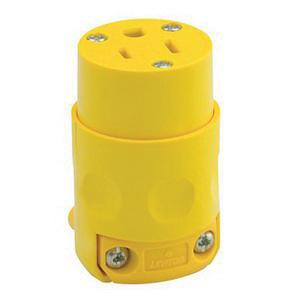 Grounding connector in yellow color, has rugged PVC body that resists moisture and chemicals. Unique dimpled body design of this connector ensures secure grip. It withstands current rating of 15-Amps and voltage rating of 125-Volts. Commercial-grade connector with screw terminal connection, has brass contact for optimal signal conductivity. It withstands 2000-Volts dielectric strength per UL498. Connector has zinc-plated steel assembly screws for easy installation. This 2.61-Inch connector has 1.38-Inch top Dia and 1.54-Inch bottom Dia. It withstands temperature range of -40 to 60 deg C. This connector has NEMA 5-15R configuration. It has V-2 flammability rating per UL94 to withstand harsh environmental conditions. Straight blade connector is UL listed, CSA/NOM certified and meets ANSI standards.